The second edition of the Chinese Film Festival has not only been in the spirit of introducing Chinese films to all, but also one of making these Chinese films accessible for all that are interested. 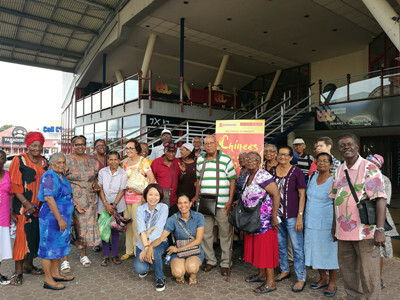 Rounding up the first week of the festival, senior citizens from four retirement homes of Ashiana, Prinses Margriet, Betheljada and Albertine were treated for a day at the movies by the organizers of the festival, the Embassy of the People's Republic of China in Suriname and the Surinamese Chinese Friendship Associations. At TBL Cinemas, they attended the screening of the movie "Song of Cotton", a story of an elderly man with dementia who is cared for by a live-in caregiver. The movie was specially chosen as it tackled issues similar to those in the retirement homes, while also adding a touch of humor to the elderly– caregiver relationship. Although the film is in Mandarin Chinese with only English subtitles, it has not become an issue for the elderly as the film was met with burst of laughter from time to time. "It was a great movie!" many elderly complimented on their way out to the representatives of the Embassy of China and the Suriname Friendship Association, proving yet again that a good and relatable story can touch us all, even if it is in a foreign language.